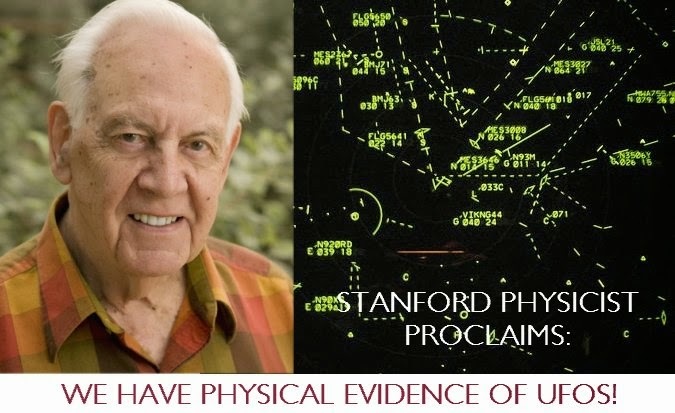 The UFO Partisan: Stanford Physicist: We Have Physical Evidence Of UFOs! Peter Sturrock is an emeritus professor of applied physics at Stanford University and one of the very few scientists who has publicly expressed a great deal of interest in UFOs and acted on that interest by twice surveying colleagues on the subject which resulted in some very surprising findings. He is also unambiguous on one particular category of UFO evidence which he happens to know a little bit about . . . . radar reports. "Yes - radar is physical evidence," Sturrock stated in an email exchange he was generous enough to grant me. Professor Sturrock's involvement with radar dates back to World War II. While studying mathematics at Cambridge University, he interrupted his studies to help in the war effort and joined the Telecommunications Research Establishment in 1942, now known as the Royal Radar Establishment, where he helped develop radar systems. Skeptics commenting on the UFO phenomenon often claim that a major problem with UFOs is the only evidence are witness sightings, claim they are unreliable and cite a lack of physical evidence. While that is often the case, there are notable exceptions where physical evidence does exist in the form of radar reports and they corroborate the accounts of multiple credible witnesses. There have been a number of famous UFO cases that have involved radar reports and two of the most famous contemporary incidents are the JAL Alaska case from 1986 and the Stephenville, Texas sightings of 2008. On November 17, 1986, a Japan Air Lines 747 cargo jet, piloted by Captain Kenju Terauchi, was flying westward near Mt. McKinley when he spotted a UFO. "Then there was a kind of reverse thrust, and the lights became dazzlingly bright. Our cockpit lit up. The thing was flying as if there was no such thing as gravity. It sped up, then stopped, then flew at our speed, in our direction, so that to us it looked like it was standing still. The next instant it changed course. There's no way a jumbo could fly like that. If we tried, it'd break apart in mid-air. In other words, the flying object had overcome gravity," Terauchi said. Terauchi and his crew had the sighting but John Callahan, the FAA Division Chief of the Accidents and Investigations branch, had the data. The radar report covered more than a half hour. Callahan states in the following video interview, "As far as I'm concerned, I saw a UFO chase a Japanese 747 across the sky for over half an hour on radar." He goes on to say that members of President Reagans Scientific Study Team, the FBI and the CIA he met with about the incident expressed excitement at the data. The Stephenville, Texas case of January 2008 featured dozens of residents of the Texas town and its' surroundings sighting UFOs. Some reported aircraft the size of a football field and larger. Freedom Of Information Act requests were quickly sent to the FAA, National Weather Service and local Air Force bases by radar expert Glen Schulze and Robert Powell, MUFON Director of Research, seeking radar data for January 8. In their summary, Schulze and Powell wrote, "The enormous size of the object, its' complete silence and its' ability to travel at high rates of speed and to also remain stationary or travel at slow speeds is not explained by any known aircraft. Based on approximate distance of the object and witness descriptions of degrees of sky covered by the object indicated an object closer to 1000 feet in size. Twice, radar picked up an unknown object flying at 1900-2100 mph. "They discussed their findings in the CNN interview below and the full radar report is available at this link. I also asked Professor Sturrock if he had a favorite UFO case and he replied, "The Coyne helicopter case." On October 18, 1973, the four-man crew of an Army Reserve helicopter heading towards Cleveland from Columbus had an otherworldly encounter with a UFO at about 10:30 PM as they were flying near Mansfield, Ohio. "This craft, from the angle that we saw it, was cigar-shaped. It had no wings, no vertical or horizontal stabilizer, was approximately 60 feet long, 15-20 feet in height. We were at 1,700 feet, then this craft began to move slowly to the west away from us. At this time, I was worried we were going to hit the ground, and I looked at my altimeter and our helicopter was at 3,500 feet, climbing 1,000 feet a minute with no changes in the control. We went from 1,700 feet to 3,500 feet in a matter of seconds and never knew it!," Lawrence Coyne, the commander of the helicopter recalled. There were civilian witnesses on the ground as well. "I had driven a few blocks from my house and was driving north on Paul Boulevard. I stopped the car once I saw how close the UFO was above the tree line over-looking Sunset Park. The chopper was beneath my view. Here in plain view was the UFO, green light on the front, white light and a red light on the rear on a nearly sixty-foot long dark metallic-grey object that had the appearance of a cigar shaped stogie. I sat in my car marveling at its appearance. It made no sound. Suddenly the UFO shot off towards the northwest and in literally seconds it was the size of a star in the distance. Even faster, the object disappeared from sight." said Bill Carver, brother of Jim Carver, the author of the article linked above. Not surprisingly, skeptic Phil Klass attempted to explain the case away but the credibility of the witnesses involved and the detail of their reports render his explanation implausible. "Any theory of the objects being a meteor (UFO skeptic Philip Klass maintains that the object was a fireball of the Orionid meteor shower) can readily be rejected on the basis of: (1) the duration of the event (an estimated 300 seconds); (2) the marked deceleration and hard-angle maneuver of the object at closest approach; (3) the precisely defined shape of the object; and (4) the horizon-to-horizon flight path. The possibility of a high-performance aircraft likewise is untenable when one examines the positions and colors of the lights with respect to the flight path of the object. To have presented the reported configurations, and been in accordance with FAA regulations, an aircraft would have had to be flying sideways, either standing on its tail, tail-to to the helicopter, or upside-down head-on." Below is a segment about the case from the 1990s TV show Sightings. Finally, I asked the professor about his own research into UFOs. In 1973, Professor Sturrock distibuted two questionaires, one to members of the San Francisco chapter of the American Institute of Aeronautics and Astronautics, the other to members of the American Astronomical Society. The AIAA survey results indicated that "a sample of scientifically trained persons reports aerial phenomena similar to so-called "UFO reports," and the AAS survey revealed that "a small fraction (of order 5%) are likely to report varied and puzzling observations, not unlike so-called "UFO reports" made by the general public," according to the professor. He also noted that, "if you want to find out whether scientists see UFOs you must ask them, and you probably must guarantee them anonymity. Scientists have no doubt been discouraged from taking the problem seriously by the bizarre nature of some of the reports and emphasis upon the "extraterrestrial hypothesis" (ETH)." Professor Sturrock's full papers on his findings are available here and here. Specifically, I asked Professor Sturrock about his opinion on expanding future queries to include social scientists like historians, sociologists and psychologists, professionals who I thought might also have some interest in and be able to contribute to the UFO field. "I would encourage similar surveys of other professions. Then the results could be compared," he replied. Finally, I'd like to thank Professor Sturrock for taking the time to answer my questions and I would also like to thank my good friend, fellow UFO researcher and the pride of Surrey in the UK Peter Mandeville for providing the tip that led to this article. This is an excellent post Frank. Most of my friends are skeptic's and will only believe we have been visited if they have something tangible they can hold in their hand and put under a microscope. Their footprint is everywhere, you'd have to be a dope not to see it. Well, I'd say you'd have to be a dope - or totally unfamiliar with first-hand accounts of UFO / alien experiences - not to see that the evidence points away from the ETH, at least in its naive, simplistic, concrete form. Calling All Extras would be a good title. Yes, the imagery is in focus. The primary object has filamentous projections making it appear out of focus. But a quick check of the other objects and stars shows both images are in crisp focus, corner to corner. As you may know, I am a published astrophotographer who does not present out of focus images. There is no controversy about the ET presence. I openly challenge any legitimate, non-governmental evaluation of the film positives for authenticity. Great hearing from you Stephen! I will post this link at my Facebook group. We've got more than 30,000 members so you should have some eyeballs checking out your amazing work. Thanks! Nice job with the interview. I was specifically interested in the radar portion of your post. I've been in the throws of the 1968 Minot case and radar pickup from a B-52 plays a good part in the case. Hope all is well with you and nice to see that you dusted off your blog! It's good hearing from you. This is a lot more about inspiration than perspiration for me, so i don't update too often. I did see your comments over on Tony's recent remote viewing article. It's a pretty interesting sense and I would say this UFO stuff is absolutely the type of thing it can be useful for. Does anyone know anything about this book, The Memphis UFO, on amazon? I've heard something very special about it, and I wonder what others think, before I read it... It was also in the local news (http://www.wmcactionnews5.com/story/27965766/ufo-expert-analyzes-recent-mid-south-sightings). Also, while I was looking at it I ran across some sort of a new statistical analysis of UFO events, released by a science group called The UAP Panel. Their report on amazon gives some sort of scientific measurement on each and every reported UFO incident from about 2000 years ago to now (Unidentified Airborne Phenomena, Novel Statistical Analysis Results of UFO Reports from 250 to Present Time). Does anyone know about this, as well? I heard about it from a couple people at a conference this weekend. I only have one contact in TN but I am asking. Will let you know. Where can i see the radar returns? It's in the link just above the CNN interview. you get 625 and the root of it is 25. These you get 8 times because 25 comes to two directions in every corner.